Tim Berne: Slow-Cooked Jazz Saxophonist Tim Berne came up on New York's so-called "downtown scene" 30 years ago. That scene is known for postmodern jump-cutters like John Zorn, who'd leap from one style to another in the space of a beat. But Berne went another way; he's fascinated by gradual transitions. 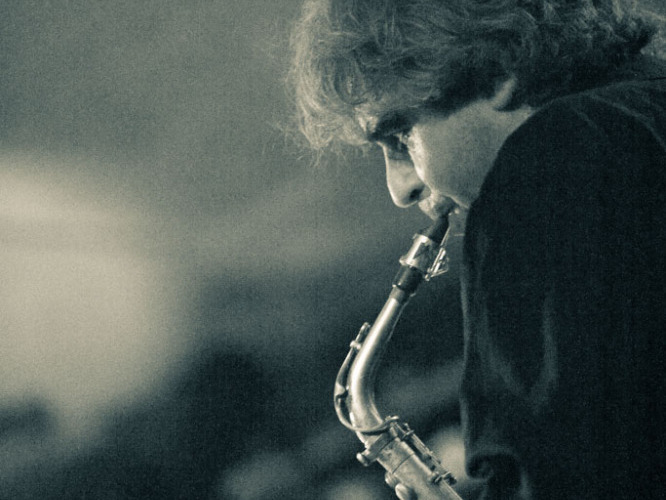 Saxophonist Tim Berne came up on New York's so-called "downtown scene" 30 years ago. That scene is known for postmodern jump-cutters like John Zorn, who'd leap from one style to another in the space of a beat. But Berne went another way — he's fascinated by gradual transitions. In his music, improvisers take their time, wending their way from theme to theme over a long, continuous set. Insomnia is a lost-and-found live recording from 1997, now out on the Clean Feed label. The music sounds so fresh that the 14-year wait is barely worth mentioning; it's pre-stood the test of time. Berne plays in all sorts of combos, but the sound here is more sumptuous than usual, owing to expanded resources. Eight pieces include a string trio of violin, cello and bass, augmented by a rhythm instrument rare in improvised music; Marc Ducret plays acoustic 12-string guitar with a woody, steely, ringing sound. Berne likes long pieces where players drop in and out; the shorter of two suites on the new Insomnia runs half an hour. But he brings a keen sense of proportion to the music, even when the players spend far more time inching between melodies than playing those lovely themes themselves. The tunes are sturdy bridge piers, supporting the improvisations that span them. Early on, Berne learned from his mentor Julius Hemphill the power of majestic long tones, and of taking your time in a style of music where players often hurry. Berne's written lines are dissonant but orderly; their strong shapes are ready-made for improvised paraphrasing. Sometimes, a renegade soloist will spin variations right over the melody, so you get the tune and the improvisation at the same time. I love the undulating texture of Berne's octet sound, as Chris Speed's clarinet melds with violin, and violin with cello, and cello with Berne's alto sax, and his baritone sax with bass. That blurring of timbres adds an air of mystery, like ghostly figures passing through long-exposure photographs. But the progress of Berne's long suites unfolds like a road novel, full of picaresque or elliptical episodes, with heroes who end up far from where they started. Or, put yet another way, Tim Berne is a master of slow cooking. He keeps you waiting, but it's worth it.